It may still be summer, but colder weather months are just around the corner. 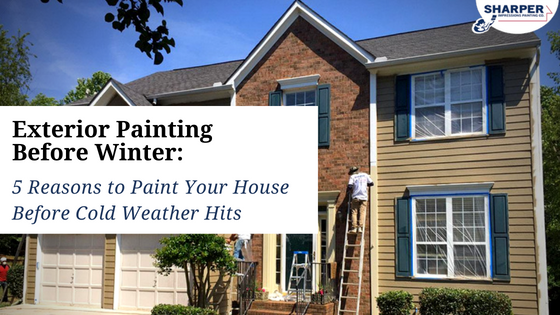 As you prepare your home to withstand frigid temperatures, snow, and icy conditions, it’s important to know that painting your house exterior is a key element of the home winterizing process. The extreme weather conditions that winter brings can damage your siding, trim, shutters, doors, and windows if you aren’t adequately prepared. While painting your house can certainly give your home a fresh new look and improve its value, exterior painting before winter also offers additional benefits you may not have considered. Before harsh weather returns and temperatures drop, a high-quality exterior painting job done by professional house painters is critical to protect your home during cold-weather months. Here are just some of the benefits you’ll receive if you paint your house before wintertime rolls around. Protect your home from wood rot and other damage. A new exterior paint job before winter will shield your home from excess moisture brought on by winter precipitation. If you don’t paint your home, winter weather can decrease the lifespan of your exterior surfaces. Your siding, trim, doors, and other exterior areas will become fully exposed to the elements, causing unnecessary damage that could otherwise be prevented with a simple paint refresh. Keep termites and other pests away. When you paint your home exterior, pests such as termites can be deterred from chowing down on wood. When paint has chipped or cracked, insects can more easily find access points to the wood underneath. Well-coated siding and exterior wood trim painting will keep these pests out all winter long. Seal your home and keep warm air inside. A freshly painted exterior works to “seal” your home to keep your expensive heat inside the house. This means you will feel even more toasty on frigid days — and you may even save some money on your energy bills! Paint will dry more quickly. Painting your house exterior before it gets too cold outside will ensure that the paint dries more sufficiently. The colder the air is outside, the longer it will take for your exterior paint to dry. Prepare your home for the holidays early. Are you planning to have friends or family over for the holidays this year? Painting your house exterior before winter is a cost-effective way to improve the appearance of your home before the holiday season arrives. Painting your house can help you cover up stains, markings and other imperfections so your home looks great for every visitor — just in time for those holiday lights! Painting early will also allow you plenty of time to think about other things during the holidays such as tackling your shopping list and attending gatherings outside your home. Make sure to get your painting quotes before your painting professional books up for the season. The best time to call is late summer and early fall to ensure you can get a spot on their schedule. This will also give you plenty of time to select and test your paint colors. Your home exterior is the first layer of protection against cold temperatures and winter weather. Exterior house painting before winter will ensure that your home looks beautiful and remains protected all throughout the season. Our experienced house painters know the best timing and materials to use for exterior painting jobs before and during cold weather months. Let us help you improve and protect your home for the winter season. Get your free exterior painting quote today!